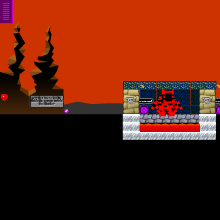 This is a remake of the third game, but it has been made easier, excluding the bonus levels as well. Story: The year is 2050. You are an old man, with a wife as old as you, and four children, three boys, one girl, who have moved out to pursue their own careers and whatnot. However, you are soon called to stop the grandson of the samurai. When you get to his layer, it is full of smoke, allowing the samurai to get away. Defeated, you go back, only to find that your town is in ruins, and your wife dead. A gang of robots and other baddies has risen up, and this time, they follow the command of a fierce ninja. Now, you must go back to the year 1337 and stop the ninja, in order to bring peace back to your time.